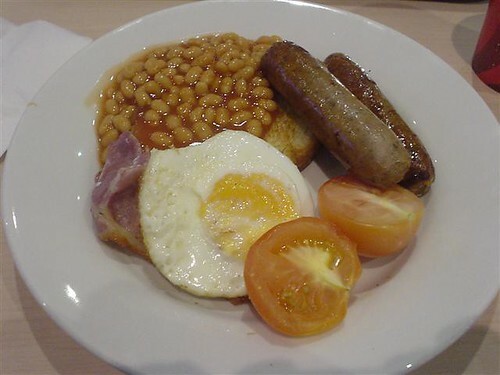 Having been there on many occasions, I can attest to the fact that the British do enjoy a healthy portion of baked beans on just about anything, and now, it even includes the paparazzi as well. 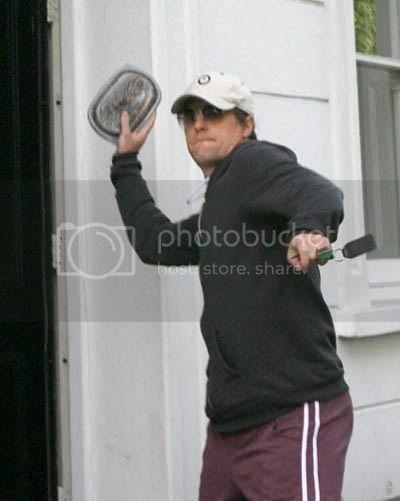 This also came last Friday, when actor Hugh Grant was arrested for hurtling a plastic container of beans at a photographer, who was lurking around just outside his Notting Hill home in London. The actor, according to British press reports, allegedly kicked a photographer three times as the pesky lensman attempted to photograph him. 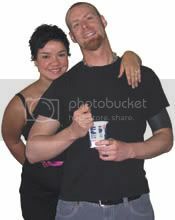 The photographer alleges Grant then picked up a large container of baked beans and threw them at the photographer, leaving him "bruised" and "battered" and slathered in the sticky mess. Police never confirmed that it was Grant who had been arrested, but did say that a 46-year-old man had been arrested and made bail, and that he would be returning to a police station next month. Charges against Grant are pending. Beans. They're not just for the toast on an English Breakfast plate anymore, apparently. Think you’ve heard the last of Rachael Ray and her favorite catch-phrase, Yum-O? Well, sorry... but think again. The reigning queen of the 30-Minute Meal and how to eat while traveling on only $40 A Day, has formed an alliance with former President Clinton to fight childhood obesity. She appeared this week on the set of her daily TV show (produced by Oprah, and much loved by Oprah devotees far and wide) with Clinton who revealed his love of cooking, along with his lifelong battle of the bulge. He then mixed tales of his weight struggles with a tutorial on the challenges of childhood obesity. Even though Clinton eventually began running 20 miles a week to try to stay slim, he always thought eating fast food was fun. About 13 million children are overweight, Clinton said, and starting with this generation, 1 in 3 are expected to develop Type 2 diabetes. For the first time, there’s a possibility that American children might not outlive their parents. "It will be immoral if we let it happen," he said. Through Ray’s daily show and her new web site, Yum-O, she’s hoping to help a family figure out how to hit the grocery store on a Sunday afternoon and come home with the right ingredients to make three simple meals for the week. Ray will work with the Alliance for a Healthier Generation, the organization that Clinton’s foundation and the American Heart Association created to combat diabetes and childhood obesity. The alliance last year elicited promises from soft-drink and food manufacturers to sell healthier products in school vending machines. It also works with schools that are reforming their lunchrooms and physical education programs. Yum-o will reward schools doing innovative work with Ray’s line of cookware or even an appearance by Ray herself. Ray and the Alliance are also promoting the Go Healthy Challenge, part of the Nickelodeon series Let’s Just Play , which will soon begin its second season. As summer approaches it immediately makes me think of one of my favorite culinary divas from across the pond, TV host and author, Nigella Lawson, and Forever Summer , her fresh and innovative cookbook that leaves you with the feeling of summer all year round, from around the world. In the classic style of her earlier books, here Lawson offers a wide range of summer recipes from Italian, Greek, and Spanish cuisines that can actually be eaten at any time. With an emphasis on easy cooking and easy eating, these recipes include a Moroccan roast lamb and North African prawn curry, the traditional strawberries-and-cream of an English afternoon picnic, the traditional Spanish barbeque, a selection of unusual ice creams and other desserts including a luscious Margarita Cheesecake ice cream, and so much more. This book ties in with Lawson’s Channel 4 TV series by the same name in the UK, and is a sure must-have for all cookbook shelves. Clearly, Nigella Lawson makes both the living and eating easy for summer. 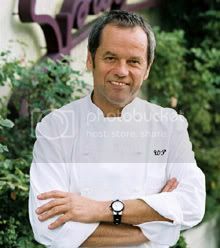 As part of a new initiative to fight animal cruelty, celebrity chef, cookbook author and Home Shopping Network entrepreneur, Wolfgang Puck, says he will no longer serve foie gras, the fatty liver produced by overfeeding ducks and geese. In a recent announcement Puck said guests at his restaurants want to know (before devouring it, of course)that their food: "Is made with fresh, organic ingredients and that the animals were treated well." Okay. "Now all that's left for them to do is to stop buying from farms that feed their livestock Burger King." Okay, in the wake of the recent shock-jock Don Imus saga of: "I said a bad thing and I’m really sorry, sorry, sorry, sorry..."(which I truly believe at this point -- he is), contrary to the opinions of some, I think his good deeds toward people in need and especially his Imus Ranch For Kids with Cancer should also be remembered. 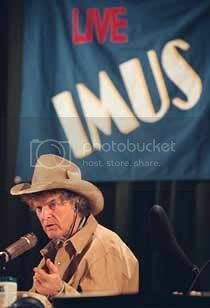 As far as the mega "tax write-off" comments that keep circulating regarding Imus, his wife, Deirdre, and their commendable works on behalf of several worthy causes -- one would argue that they could very simply write a check and still be eligible for such a write-off. Instead, they donate countless hours of their time as well as money to these worthwhile efforts. Read more here about Big Y Foods' decision to pull Imus Ranch Foods from its supermarket shelves in connection with the firestorm surrounding Don Imus' recent remarks. This, of course, in NO way excuses Imus’ thoughtless words describing the beautiful women of the Rutgers University Women’s Basketball Team, whose academic excellence, by the way, is unparalleled. Nevertheless, after the meeting that has now taken place between Imus and these admirable young women, hopefully, Don Imus can move on to Satellite Radio (come on now... was there ever any doubt he just might wind up there after the termination of his 30 plus years for CBS Radio, crass remarks and raunchy satire in tow??) and we can focus on other important issues of the day. 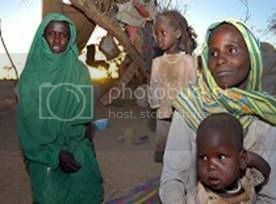 One such issue, is the ongoing situation in Darfur, and how we can help. On Sunday, April 29th, Dining for Darfur 2007 will be held to coincide with the release of Don Cheadle and John Prendergast's new book, Not on Our Watch: The Mission to End Genocide in Darfur and Beyond . This year, the charity dine out event will take place in restaurants in New York City and across the country. All DFD restaurants have pledged to donate 5% of sales for one night to the lifesaving humanitarian work in Darfur and Chad. So remember, mark your calendars to eat out -- and make a difference to thousands of survivor's lives. Read more about this event here. In her new memoir, Easter Everywhere , novelist Darcey Steinke, author of several novels including Jesus Saves , recounts her life as a minister’s daughter, traveling the country and acquiring tastes for regional dishes like fried okra. "When you get it right," says Steinke, "It’s like crack." Now a resident of Prospect Park, Brooklyn, this former Spin Magazine rock-writer correspondent shares in vivid detail her derailed life as a minister’s kid, and her father's professional life in a poverty-ridden carnival town where he builds a modest A-frame church from a mail-order kit. And then, of course, there's her voluptuous mother, a former beauty pageant queen systematically worn down and oppressed by the degradation of being a poor Lutheran clergyman's wife. But these days, however, although her new "inner city" lifestyle has yet to avail the perfect eats of her days gone by, Steinke is said to be very fond of the local Caribbean jerk chicken offerings, and as a survey here of her most recent meals reveals, she also knows where to find exceptional sauerbraten, sticky-toffee pudding, and the classic Waldorf salad (with marshmallows) -- which she usually enjoys amidst the company of a local order of nuns. Easter Everywhere is a satisfying journey into the complex yet totally engaging story of Steinke’s life, as well as a remarkably good read that should not be missed. Be sure to check this one out soon. "5 Boroughs Ice Cream began on our couch in Astoria, Queens. First as a hobby—then an obsession! We thought, "what if there was an ice cream flavor for every neighborhood in the city?" Inspired by the different neighborhoods and the people who live in them, we saw NYC as an inexhaustible source of flavors to create. In the spirit of a city built on mom & pop shops (not Starbucks and Cold Stone! ), we use locally made ingredients so that our flavors are as intense as they are unique. We handcraft our rich, 16% butterfat premium ice cream in small batches to ensure the taste and quality that we’ve all come to expect from the greatest city in the world." Needless to say, I’m proud to announce that 5 Boroughs Ice Cream will be available online later this year. I'm totally looking forward, Scott and Kim!